I don’t think having an Omochao recolor is going to boost sales of the Deadly Six edition. I mean, honestly, why does Sonic Team keep shoehorning Omochao in when no one likes it? If you’re going to have Chao in the game, make it a Chao Garden and make some of your fans happy. To be completely honest, I think people overreact about Omochao – they say he is the most irritating thing in the franchise, but where does he pop up in the games that often? Last I saw of him/her/it was in Generations, & you can switch him off at the options. Before that, I remember him being in SA2(B), but he was always at the corner or not in front of the player’s path. I know, I know, but still. I have gone to the local game shop here so many times to see if they have the Deadly Six special edition, and NOTHING! On the positive note, I put my copy of Sonic Lost World on pre-order MONTHS in advance! 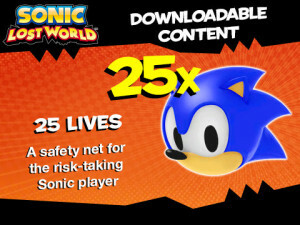 Just like all of the initial copies of Sonic & All-Stars Racing Transformed were the Limited Edition, all first print copies of Sonic Lost World Wii U will be the Deadly Six Edition (except I think it’s called the Deadly Six Bonus Edition in America). Just pre-order the game and you’ll get the Deadly Six Edition, almost certainly. I really hope they release the DLC at a later date on the EShop on a future. I’d hate owning the standard edition knowing that there’s a small bit of content missing. Does the 3DS version get a pre-order bonus too? Or is that just the Wii U version? Just the Wii U version, I’m afraid. I am guessing they’ll play like all the other RC Vehicles, but it is the perfect place for them because Omochao does fly and exists to assist you. Phil Collins? lol Nice name. Anyhoo I wonder what the Golden Omochao does. Assuming it doesn’t annoy everyone else (as I was only annoyed by him in Heroes and sort’ve Generations) then hopefully he’ll be useful in some cool ways. It’s coming to GameStop as well. Thanks for the heads up – updated the article! Staff Edit: Please don’t stretch the page. It’s just a bonus for preordering the game, you can’t just buy extra lifes as DLC after the game has come out. SEGA! I hope they didn’t add a button where one player can just press and Omochao would just yell tutorials. also dat Sonic Omochao…It better go fast :D! 1. Closest thing I’ll ever get to playing as my favorite Sonic character, Chao. 2. It isn’t talking much, so I see no issue. 3. If it gets hurt, it will be fun. 4. I look forward to something that isn’t Sonic himself sometimes. 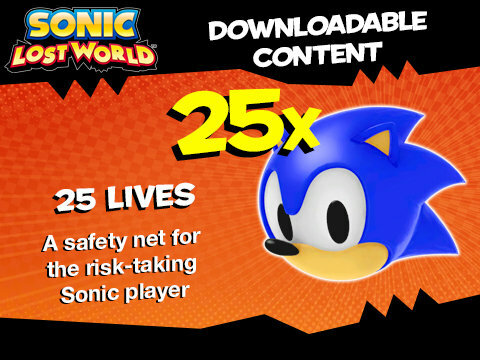 Oh, but 25 lives is a pretty dumb pre-order idea, I’ll say… however, while pointless, it brings no harm. EXTRA LIVES IS DAY 1 DLC?!!! *facepalm* Its just a preorder bonus. If you didn’t preorder from that retailer, you don’t get the bonus and you can’t buy them as normal DLC. I am in impressed of Sega putting DLC Codes of downloadable content of black 5 black bomb and Rare Omochao Rc Garget,! 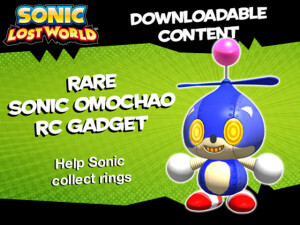 also on GameStop have another DLC codes down content 25 life’s for Sonic and Rare Sonic Omochao Rc Garget,! I have a Wii U and a 3Ds XL. I already pre-ordered the game for the Wii U but I’m not really planning to get the 3Ds version anytime soon. Sooo… Does the RC controller require a copy of the 3Ds version or will it work with just the Wii U standalone version? Nope, you only need the Wii U version to use the RC. The 3DS version is only needed if you want to build extra RC vehicles and then transfer them over to the Wii U. This is perfect. The RC Omochao. Have it hover around Sonic. Add in some dialogue. Post it on Youtube. Nothing yet from them, however as soon as there is an update, I’m to be notified by E-mail. The exploding bomb looks way to Mario imo. Wish the series would go back to the adventure, adventure 2, battle, Shadow, heroes days. Personally my favorite. Love the Sonic omnichao, but so far thats all I like. I hope that this game turns out to be good, but my expectations are low. Amazon.co.uk are giving 25 free lives and an Omochao RC Gadget but its not specified which Omachao.